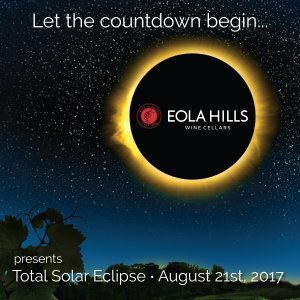 A solar eclipse will come to Oregon on Monday August 21st, 2017, and the Eola Hills Legacy Estate Vineyard, located just west of Salem, OR, falls directly in its path. You’re invited to share this rare celestial event at their 160-acre vineyard, which offers spectacular hillside views of the coastal range and the Willamette Valley. USA Today rated the Legacy Estate Vineyard as “one of the top viewing spots in the nation”. An entire weekend of activities is planned, including four concerts, educational star gazing parties, a farm to table dinner at the lake, a wine country bike tour, and a solar eclipse viewing party. All activities will be held at their Legacy Estate Vineyard, and there is something for everyone! The weekend kicks off with Nu Shooz on Friday night, August 18th, at 6 p.m. Nushoozmusic.com states “Grammy nominees NU SHOOZ filled the airwaves and dance floors of the ’80’s with their own brand of Soul and R&B. Known for their chart topping crossover hits, “I Can’t Wait,” “Point of No Return,’ and “Should I Say Yes,” the band gained a world wide fan base and a place in music history.” Food carts, wine tasting, and telescope stargazing are available for your indulgences. The festivities continue on Saturday night with a farm to table dinner, prepared by Chef Pascal Chureau of Field and Vine Events. Dinner starts at 5 p.m. and seating is limited. This unique dinner will be hosted on the shores of Legacy Lake and Grammy winner, Patrick Lamb, will serenade guests. Eola Hills’ head winemaker, Steve Anderson, will present wine pairing for each course. If you are unable to make the dinner but love jazz, then join the party on the lake after the dinner. Concert opens at 6:30 p.m. along with winetasting and telescope viewing throughout the evening. If you think Sunday should be reserved for a road bike and a stop at a few wineries, then join Eola Hills for their popular “Bike Oregon Wine Country”. Check their website for more details to reserve your spot for this special “Tour d’Eclipse”. Riders should plan to meet at the Legacy Estate Vineyard Sunday morning. Sunday night brings Quarterflash to the lake. Concert opens at 6 p.m. This popular 80s band is known for hits such as “Harden My Heart” and “Find Another Fool”. This show is expected to sell out so reserve your tickets now. Telescope viewing, food carts, and wine tasting will again be available for concertgoers. Monday, eclipse day, is a day full of food, wine, and entertainment. Early arrival is encouraged. Eola Hills has arranged for a continental breakfast spread, starting at 8:30 a.m. to ready you for the big event. Just before 10 a.m., because of the west-facing vineyard, event goers will witness the umbra shadow racing across the Oregon Coastal Range. At approximately 10:15 a.m. the eclipse will begin, and will be in totality for over 2 minutes. The vineyard is perfectly designed to enjoy the event in its entirety. The party continues as Five Guys Named Moe rock the lake concert venue again, and eclipse goers enjoy wine and award winning BBQ from Slick’s BBQ from Sisters, OR. Eola Hills Wine Cellars is delivering options for every budget. Additionally lodging in the Willamette Valley has mostly been booked out for months. Eola Hills has reserved blocks of rooms at 2 local hotels and over 100 dorm rooms at Western Oregon University for customers attending events. Also, there are camping sites at the Legacy Vineyard available for those who want to rough it. The viewing party entry fee on the 21st is $95 for basic, $150 for VIP, and $50 or less for children. Other weekend-long packages and a la carte options can be explored on the winery’s website at www.eolahillswinery.com or directly at http://eolahillswinery.com/total-solar-eclipse-viewing-party/. For questions, call Stephanie Bobb at 503-623-2405 | stephanie@eolahillswinery.com. In 1982, Oregonian Tom Huggins and 11 investors established their first vineyard, and in 1986, Eola Hills Wine Cellars produced its first wines. Today, founder Tom Huggins serves as General Manager and CEO. Head winemaker Steve Anderson has been with Eola Hills for more than 20 years. Eola Hills Wine Cellars strives to produce excellent wines at fair prices – wines that capture the spirit and flavors of Oregon. Eola Hills focuses on cool-climate varietals including their award-winning Pinot Noir, Pinot Gris, Chardonnay, sparkling wines, along with several other unique varietals and offerings. Eola Hills Wine Cellars sustainably farms and manages 300+ acres within the Eola-Amity Hills American Viticultural Area (AVA), in Oregon’s mid-Willamette Valley, between Salem and the Oregon Coast Range. The winery and main tasting room are located in Rickreall; two additional tasting rooms can be found at Legacy Estate Vineyard in Salem, and in historic, downtown McMinnville. For more information, go to www.eolahillswinery.com.